Thousands more young people will have the chance to take part in international exchanges and visits thanks to a new £2.5 million programme, the Education Secretary announced today (19 January). 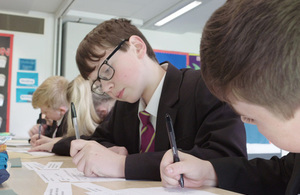 The programme will build on the government’s work to encourage more pupils to study a foreign language, including their inclusion in the English Baccalaureate. Since 2010 we have seen 45% more entries in GCSE Chinese and 51% more entries in GCSE Spanish. "I want every child to have a world-class education, and that includes the opportunity to experience other cultures and go to places they wouldn’t normally visit – whether that’s practising their Mandarin in China or learning about American history in the US. "Pupils keep the memory of a school trip abroad for the rest of their lives – it is an important first step in understanding the world. It encourages children to think about working and studying overseas and sows the seeds of international co-operation that we encourage in young people all around the world." "This programme will expand students’ international horizons and experience, delivering on our school’s vision to help the young people of Seaham to achieve the highest possible outcomes and to make a valuable contribution to the global society in which we all now live. Schools will be able to register their interest on the British Council website from Monday.